All transactions are safe and secure with a reliable history in online purchasing behind each of our associates. 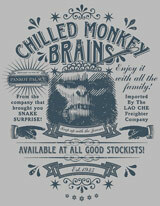 Buy the Chilled Monkey Brains t-shirt to own Indiana Jones clothing and merchandise. This bestselling Indy t-shirt features a Chilled Monkey Brains design surrounded by related elements from Indiana Jones and the Temple of Doom. In the movie, Chilled Monkey Brains are served as dessert at Pankot Palace in India. The soft brains are served in the open head of the monkey. They are served to Indy, Short Round (Jonathan Ke Quan) and Willie Scott (Kate Capshaw). Wear this tee with a classic Indiana Jones Fedora hat and underneath the equally stylish Indy leather jacket. In addition to the Chilled Monkey Brains tee above, browse the Indiana Jones Clothing Gallery for more apparel like men's and women's clothes, kids shirts or hoodies.